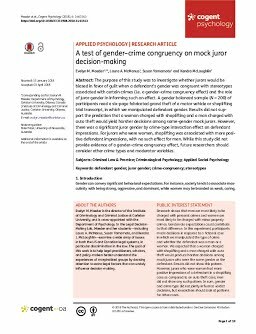 The purpose of this study was to investigate whether jurors would be biased in favor of guilt when a defendant’s gender was congruent with stereotypes associated with certain crimes (i.e. a gender–crime congruency effect) and the role of juror gender in informing such an effect. A gender balanced sample (N = 200) of participants read a six-page fabricated grand theft of a motor vehicle or shoplifting trial transcript, in which we manipulated defendant gender. Results did not support the prediction that a woman charged with shoplifting and a man charged with auto theft would yield harsher decisions among same-gender mock jurors. However, there was a significant juror gender by crime-type interaction effect on defendant impressions. For jurors who were women, shoplifting was associated with more positive defendant impressions, with no such effect for men. While this study did not provide evidence of a gender–crime congruency effect, future researchers should consider other crime types and moderator variables.